A mind-numbing number of dedicated newspaper people have seen their careers brought to abrupt and premature halts as the result of the industry’s relentless budget cutting. But the true loss of these fine people to a newspaper – and their communities – typically isn’t conveyed in the rote announcements that most papers dutifully print when many of their most senior staffers are ushered out the door. 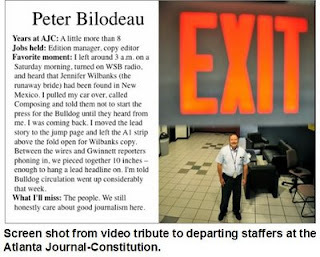 The impact of this loss at one newspaper is conveyed quite poignantly in a video marking the departures of more than 70 staffers of the Atlanta Journal-Constitution during its recent buyout. Together, the exiting staffers represent more than 1,000 years of service to the newspaper. The video, which is called “A Farewell to Friends,” was distributed internally last week. You can view here. But readers won’t find it at AJC.Com. UPDATE 9.6.08: And now the video is no longer available at the link above, either. Isn't the fact this story is conveyed as a video positively ironic? Odd thought: I'm wondering whether they secured a license for the music on the video. Any idea of what these talented people are going to do? It's pretty clear by now that the old newspaper business model can't generate enough cash to pay them. But this amount of experience and talent is not going quietly into the sunset. Are they getting involved in citizen journalism? writing books? going into education? PR? Government? I think getting this info could shed some light on emerging business models. I have sympathy for the dearly departed; I've been "downsized" myself. But as a former AJC subscriber, I'm awfully glad. Local coverage is pathetic and that's the only reason to buy a newspaper anymore. The sooner the dinosuars are extinct, the better for their evolutionary descendants. Looks like they pulled down the video. Unfortunate!